Travel down a charming footpath, and discover Gimme Shelter, named after a favorite tune of the owners. 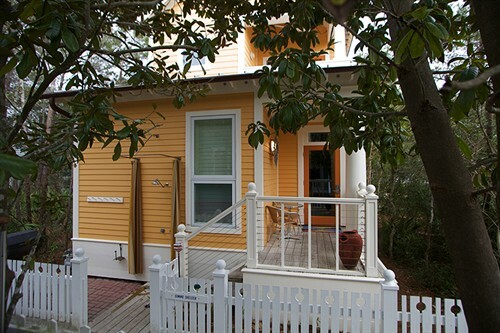 This stylish cottage is located on Butler Street, which is near the Lyceum and Ruskin Place Artist Colony, and has an eclectic decor with contemporary furniture and warm bold colors. On the first floor, there are two bedrooms, each with queen beds and a private full bath. Upstairs, the second floor includes a living/dining room combination, as well as a fully-equipped kitchen. If you need shelter from the hustle and bustle of everyday life, Gimme Shelter will do it for you! For additional options, this cottage may be rented as a one-bedroom Lockoff. No children under 8 years of age please. This cottage is booking up fast for the rest of July and August! There are still a few weeks open in August! Gimme Shelter is a participant in our Spotlight Savings Special. 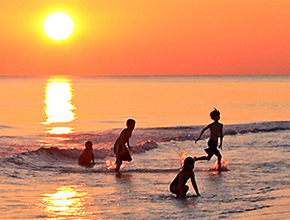 Save $110 on the first night and $70 on each additional night. Click here for more details.